The medieval Skhvilo fortress prison overlooks the ancient village of Samtavisi and the rest of Shida Kartli’s Kaspi region, a rolling expanse of contours that in July are wrapped in overtones of green and gold under a sky that would make Montana buckle in envy. From here we can see the Mtkvari River Valley spreading east to Tbilisi, west towards Surami and south to the Trialeti Range. Even on blistering summer days you can count on a breeze of honeyed air brushing down from the high Caucasus suggesting that if the Garden of Eden had a vineyard, this is where it would be. This particular micro-zone is called Charmants – charming – a name French viticulturists gave it in the late 19th century, when local noblemen invited them to select the best areas to grow vines. 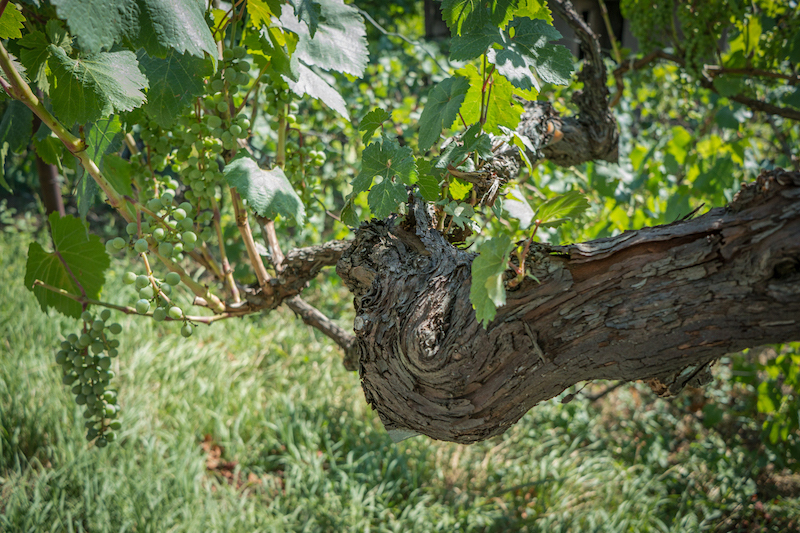 Eleven years ago, Tbilisi-based artists Mamuka Kikvadze and Lako Teneishvili bought a patch of this charming Eden that included a 100-year-old house and a small vineyard of Chinuri grapes – also called “Chinebuli,” which means “magnificent” in Georgian. Some say this wine was made for kings, back in the day. We are sitting at a homemade picnic table under the shade of plum trees in their front garden. Lako has brought out a succulent bowl of ajapsandali (Georgian ratatouille), a platter of cheeses including a violet Sulguni soaked in Saperavi, a most savory purple tkemali (a sweet-and-sour sauce made from plums) and a plate loaded with perfectly fried potatoes. “The first time I had Chinuri was 15 years ago, from a friend in Ateni – Atenuri Chinuri. It was amazing, truly unforgettable,” recalls a beaming Mamuka, as he pours his own unfiltered, light amber Chinuri into our glasses. This grape is native to Kartli and is its most widely cultivated white. High in acid and sugar, it is often associated with notes of wild mint, pear and apple. 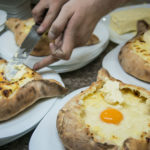 But in the region’s villages, Chinuri is typically a mousy affair because washing out kvevri – the large clay vessels in which Georgian wine is traditionally aged – requires a diligence and care that many people just can’t be bothered with. And then there are the mortal sinners who add sugar and water and turn what could be decent wine into a Georgian Boone’s Farm. Just because Georgia is the cradle of wine and viticulture is in the blood, doesn’t mean everyone makes exceptional wine. In fact, very few people do. But this glass is mega-balanced, subtle, delectable, utter bliss. Six months of skin contact with no stems or seeds. 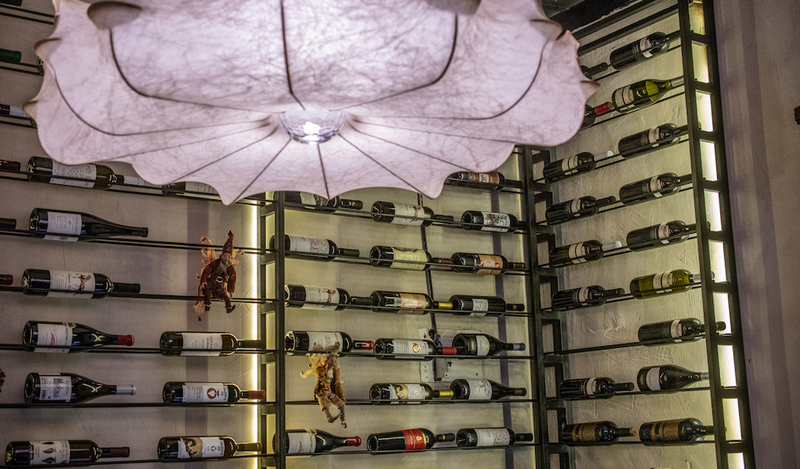 Only a handful of winemakers can conjure magic from Chinuri like this. To make Chinuri from a kvevri this gentle and smooth means that Mamuka’s wine mojo is totally working. Born in 1978 in Guria, west Georgia, Mamuka Kikvadze grew up helping his grandfather make Chkhaveri kvevri wine in Likhauri. He admits that he wasn’t immediately awestruck by this Samtavisi house at first – it just happened to be for sale next to a plot of land his father had. Transplanting Gurians is not easy as they have stubborn, umbilical-like connections to their native land. Today, however, he can’t imagine being anywhere else. “Everything here is for me and my family now,” he asserts. His wife Lako had a Gurian grandfather. To help ease his eternal longing for Guria, Mamuka bought an antique wooden Gurian house and relocated it here, some 250 kilometers away, next to his Shavkapito vineyard. In August he will build another marani (wine cellar) and bury 19 kvevri made in Guria with a total capacity of 2,000 liters. 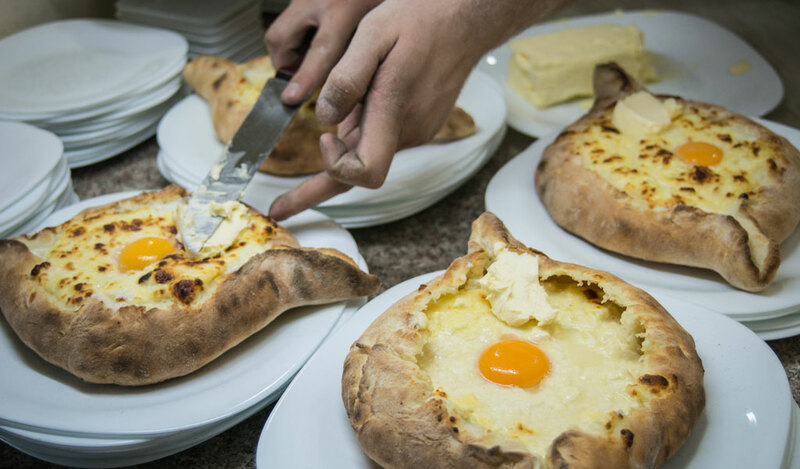 “Gurian kvevris give a different flavor than Kakhetian and Imeretian ones,” he maintains. “I am a winemaker from Guria. I will use kvevri from Guria,” he adds with a sly smile. 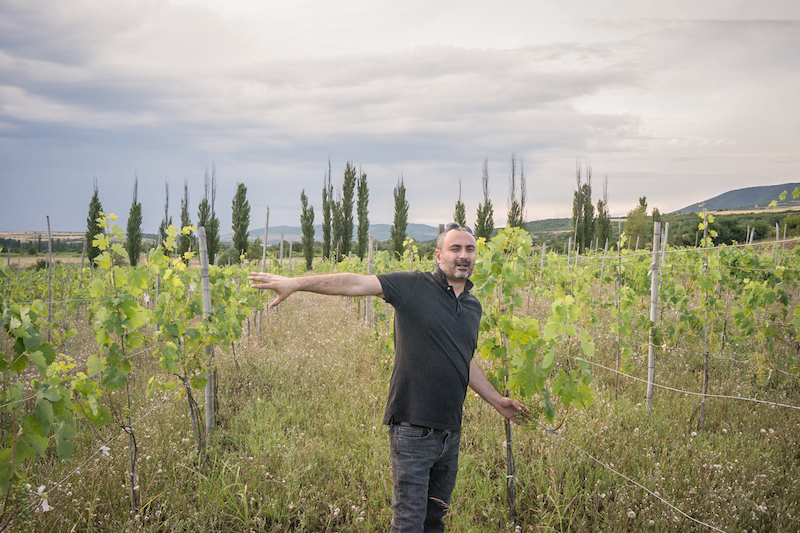 Mamuka made his first wine from his small backyard vineyard in 2011 and shared some with the late Godfather of Georgia’s natural wine renaissance, Soliko Tsaishvili, who was so taken with such an honest, first-time Chinuri he suggested Mamuka bottle it. The first vintage of 280 bottles sold in a month. Today he has two hectares of vineyards, and last year corked 1,000 bottles. “Soliko wasn’t a winemaker, he was a grape cultivator. For him, the vineyard was the most important part,” Mamuka affirms. It is one of Soliko’s many concepts he has taken to heart. “Now we don’t count. When we start counting and measuring, something will get lost. I just want to make my wine and let it speak for itself,” he explains. Some have suggested they get an official biodynamic certificate, which would no doubt help market their wine, but it’s a path neither have a desire to walk down. “It’s like having an art commission telling a painter what to paint, what paint to use,” says Lako, rising from her bench. Mamuka nods in agreement. He uses only copper and sulfur-based pesticides; there is no chemical intervention in the vineyard nor anything added to his wine in the marani. It is all natural. Draining the creamy remains of our glasses, Mamuka surprises us by saying next year, he will probably make his Chinuri with no skin contact. “Why mess with something if it is this good?” we wonder. But Mamuka and artist-winemakers like him do not aim for consistency – that’s what big wineries do. Artists toil in their vineyards and maranis in an effort to continually create more exceptional vintages each year. We trust the Goruli-Mtsvane that Mamuka wants to bottle unblended next year will be imperial, and we’re sure that in two years his first red, Shavkapito, will be no less outstanding. And we can’t wait to someday uncork a rare endemic ruby called Buza (named after the flies it attracts when the skin bursts at harvest) that he has planted. But right now we couldn’t be happier sipping his family Chinuri. “The key to winemaking is to trust yourself and to believe in your wine. Follow your instincts,” Mamuka says shortly after making a toast to Soliko. “Good wine, by itself, finds people that will love it,” he adds. It sounds like the beginning of another toast, but instead of cracking open another bottle, we get up to meet his grapes out in the vineyard. There will be more wine later. 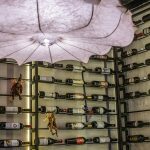 Learn all about Georgian wine on our Tbilisi culinary walk!